Editor’s note: The Phoenix Board of Adjustment voted to overturn the Zoning Administrator’s ruling of Dec. 14, effectively now approving the two variances and the use permit. Opponents have the option to appeal the ruling to the Arizona Superior Court. For more details, read the upcoming May issue of the North Central News. The hearing on a proposed medical marijuana dispensary for 1616 E. Glendale Ave. was rescheduled to April 5, and neighbors in the housing developments to the east of the property say they will turn out in numbers to oppose the request. 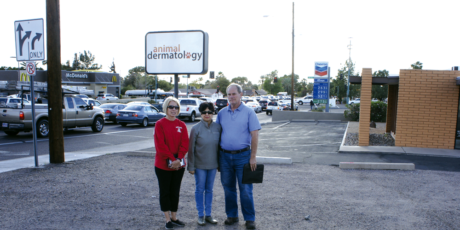 The applicant, Mitchell Song 64 Alpha, LLC, has filed a request for two zoning variances and a use permit for the proposed site, which most recently operated as Animal Dermatology, PC, located to the east of the Chevron gas station. Julie Karasek (left), Helen Houser and Eric Thomas, all residents of the Monteil neighborhood at 17th Street and Glendale Avenue, say the already bumper-to-bumper traffic on Glendale Avenue would become more jam-packed—and more dangerous—if a medical marijuana dispensary moves in where an animal dermatology clinic used to be just east of the intersection at 16th Street (photo by Teri Carnicelli). Mitchell Song, DVM, has owned the .2-acre infill property at 1616 E. Glendale Ave. since April 2003 and is part of the new partnership. The 1,618-square-foot building was constructed in 1964. Song and his partners want to turn the building into a not just a medical marijuana facility, but a wellness center which would also sell health and wellness items. A maximum of 25 percent of the items would have THC, the psychoactive compound in marijuana. According to city zoning regulations, a medical marijuana dispensary needs to be 500 feet away from residentially zoned property, and at least 1,320 feet of a place of worship. There are homes and a church closer than those distances, so two variances are needed. A hearing before the city’s Zoning Administrator was held Dec. 14, at which time Zoning Adjustment Hearing Officer Ray Jacobs denied the requests. The applicants filed an appeal the to Board of Adjustment, originally scheduled for March 1 but later moved to the board’s April 5 agenda. Mitchell Song was contacted regarding a comment for this story, but did not reply by press time. Residents of the adjacent neighborhoods say the location of the building is going to cause more traffic issues in an already congested—and accident prone—area. The building lies just to the east of the intersection, on the north side of Glendale Avenue. Customers traveling east on Glendale won’t be able to turn left into the property because of the length of the intersection’s southbound turn lane onto 16th Street, forcing drivers to go to the next available left turn—17th Street—where it will increase traffic into that neighborhood as well as entice those who decide to just park and walk back down the street. Julie Karasek, who lives in the Monteil neighborhood just east of the property in question, recalls one week last year where there was an accident every day for five days in a row at that 17th Street and Glendale turn area. Helen Houser has lived in her Monteil home since 2001, and has seen the traffic grow increasingly worse as more people travel off and on the SR-51 and go in and out of the two commercial corners, one which is home to a busy Sprouts grocery store. Based on the minutes of the Dec. 14 Zoning Administrator hearing, it appears that hearing officer Ray Jacobs also was concerned about the impact on the already busy intersection. According to Jacobs’ ruling, the use permit request could “cause a significant increase in vehicular traffic is adjacent residential areas. The proposed retail sales could include peak activity that exceeds the site size.” Meaning that a medical marijuana dispensary will attract more vehicle traffic throughout the day than an office use, for example. Jacobs also noted the increased traffic could have a negative impact on adjacent neighbors. One of those neighbors is the Chevron gas station directly next door and on the northeast corner of the intersection. The manager of that station, Joe Greenbank, is fearful that the dispensary’s customers who want an easier way in and out of the dispensary will use his property for parking, which could also cause problems with his own customers trying to get in and out of the service station. Jacobs acknowledged that recent history has shown that finding sites for medical marijuana dispensaries has proven more difficult than finding sites for cultivation and infusion sites, which are restricted to industrial areas. But he found there was no special hardship related to this property, which had a business operating in it for 16 years, and under the C-2 zoning, many other uses are still available for that site. The Board of Adjustment will consider the applicant’s appeal at its regular meeting scheduled for 12 p.m. Thursday, April 5 in the City Council Chambers, 200 W. Jefferson St. To confirm this item is on the agenda, visit www.phoenix.gov, select “Other Public Meeting Notices” under City Business, and find the posted agenda 24 hours in advance of the meeting. Look for item #ZA-538-17.